So just about a year ago I started cutting out a queen size quilt for our bed. I cut 5 inch squares and the sashing during a couple of naptimes. 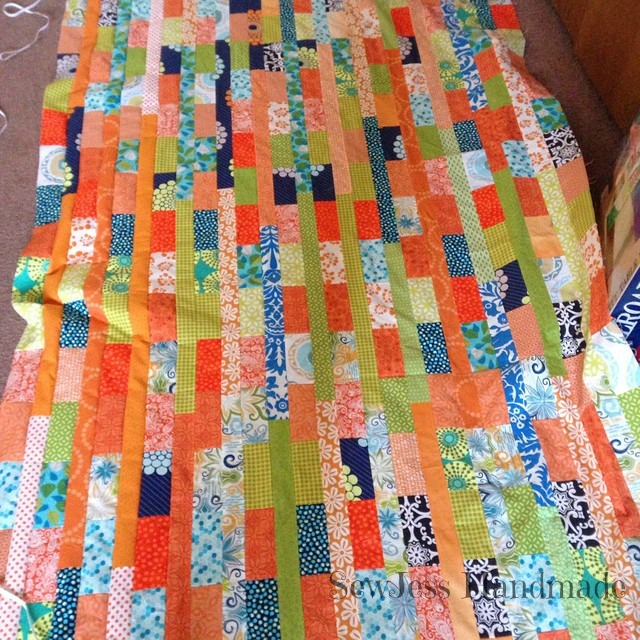 Then started a layout and even got all of the rows sewn together. Then I started working on other projects, then Christmas quilts and gifts. So needless to say this was just left in an unfinished state. Well a couple of weeks ago, the hubby mentioned something about needing to sew up the top, so the crib would be available for our new addition. (I had all of the strips draped across the crib) Well last week I had finished sewing for my current swap and didn't really need to start working on the next one, so I decided it was time to finally start piecing our quilt together! After about a hour of sewing I manged to get about halfway through the quilt top! Bonus points because Nora was still up and actually let me sew, she just pretended to iron some fabric (with an unplugged iron, of course!). Well I used the next couple of naptimes to piece the last half of the rows together and then piece them into another large half section. Then after an evening of pressing my two sections, I finally sewed them together for a completed quilt top! I was so happy that this quilt will actually fit on our queen size bed. 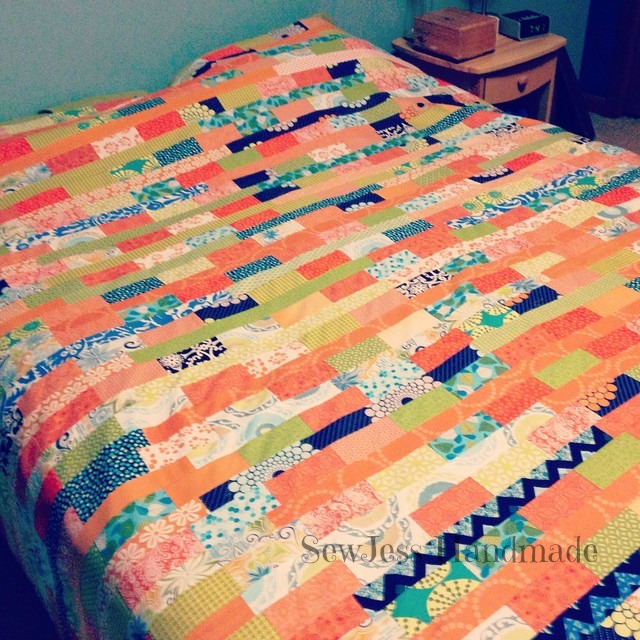 I started making this quilt when I first started quilting big time last January. I have learned so much in the last year about quilt making, so it was a little frustrating to finish up this quilt now more than a year later. Some of my seam allowances are not correct and therefore some of my rows are a little short, but as my hubby would say this quilt is just for us and who cares if it's not perfect! I have decided I will just cut an equal amount from either side to even it out. For now the top will remain like this. I have decided that I'm not going to try basting and quilting this beast while I'm 8 months pregnant. So for now I will just enjoy the fact that this quilt went from being a UFO to a WIP and will be completed in the next few months as I will need something to do combat my anxiety from dealing with two kiddos.